Today’s offering is of Russia. The basic GeoCurrents customizable map of Russia has been divided into its 85 constituent units, which are officially known as Russia’s federal subjects. Included here are Russia’s two new federal subjects (as of 2014), Crimea and Sevastopol, which are outlined with a dashed line to indicate that their annexation by Russia from Ukraine is disputed. The first map in each presentation set (PowerPoint and Keynote) merely gives the unmarked shapes of each Russian federal subject. The other maps provide names and other kinds of groupings as well. In one of these maps, the federal subjects are grouped and colored by type (oblast, republic, etc.). 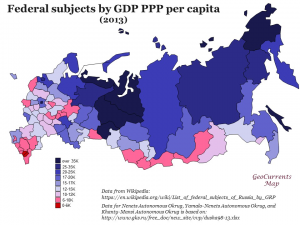 Another map groups and colors them by Russia’s economic regions. The PowerPoint set has an additional map, one in which the federal subjects are grouped and colored by Russia’s federal districts.